Calling all One Piece fans! (With money to burn.) 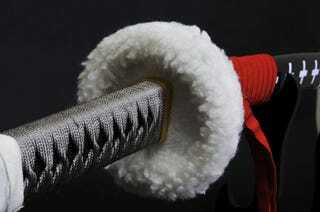 Now, you can buy some of the most famous swords from the famed manga and anime series. Toho Animation is teaming up with Japanese sword craftsmen for a series of four replica One Piece blades. These are expensive replicas that are built-to-order and are not mass produced. While they're replica swords sold via Amazon and not actual katana, capable of slicing tatami mats in half, the handle and the coating is supposedly similar to what you'd find with the real deal. These certainly sound like collector's items. Three of them—the Wado Ichimonji, the Sandai Kitetsu, and the Shusui—are wielded by One Piece character Roronoa Zoro. The Sandai Kitetsu is priced at 99,800 yen (US$934). Here's the Wado Ichimonji for 79,800 yen ($747). And the Shusui for 79,800 yen ($747). The last sword is carried by pirate Trafalgar Law, which is priced at 99,800 yen ($934). That's cheaper than the bounty on his head, no? Note that these prices do not include sales tax.